What a wonderful website! Just joined in and can`t stop reading. The link above (download and print) on this page does not work for some reason. I hope it will be fixed soon so I can save it for further reference. Thank you. 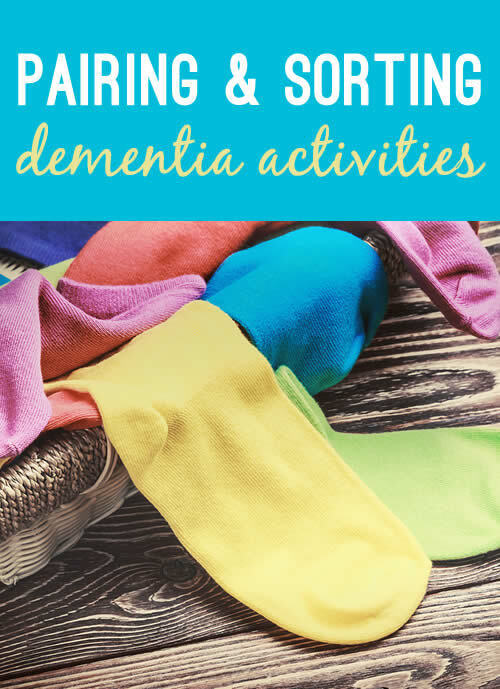 I discovered another pairing activity that was highly satisfying for some of our dementia residents. I gave them a basket or box of clean socks (obtained from the laundry) and asked the residents to "help me" by sorting and pairing the socks. I had previously separated and mixed the socks up. Sorting socks is a familiar task for most women who were mothers and housewives so participating is natural for them. Great idea thanks Sharon, the activity has been updated. Golden Carers is my life saver. There is so much to choose from. I'm printing things every night. Golden Carers is brilliant. "Imagine life without Golden Carers. Imagine doing the same activities day after day because the Golden Carers site doesn't exist. Now wake up and breathe a sigh of relief it was all just a bad dream. Thank you, thank you, thank you!!!!"